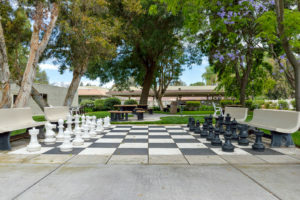 Leisure Village is a beautiful, active senior community located in Camarillo, California. 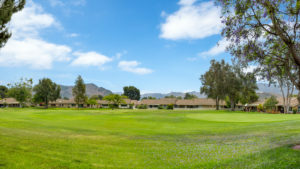 Leisure Village is nestled in the hills of the Santa Rosa Valley with a gorgeous backdrop of the Santa Monica mountains. It is a community filled with active, friendly residents making Leisure Village a fun and unique place to live. This community has 2,136 homes. All of the homes are one story, ranch style homes to provide easy access throughout the home. Twenty-five models were originally built ranging in size from one bedroom at 866 square feet to two bedroom with a den at 1,850 square feet. In addition to the many homes still mimicking the builder’s original design, many owners have customized their homes both in look and in size. Keep in mind in Leisure Village if you have seen one home… you have not seen them all! Leisure Village is located on 440 beautiful acres and was built by Leisure Technology. The community was developed over 10 years from 1973 to 1984 in three phases. 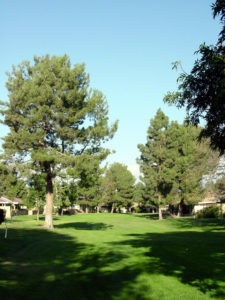 In addition to the 2,136 homes, the community includes: an 18 hole par 3 golf course, a recreation center, a swimming pool and spa, tennis and paddle tennis courts, horseshoe pits, shuffleboard courts, RV parking, a fitness center, various meeting rooms, 185 acres of beautifully landscaped common area, and much more. All of the amenities are impeccably maintained by the association. Leisure Village is a planned-unit development and is governed by an elected Board of Directors. 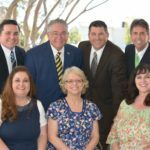 Along with the Board of Directors are many committees made up of residents who serve with the association’s professional staff. 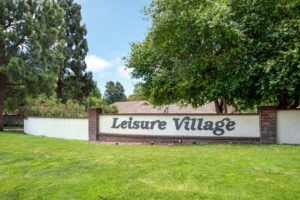 Leisure Village is age restricted; formally the community complies with State Civil Code 51.3 and the Federal Fair Housing Act, and it is defined as a senior housing development—meaning one resident must be at least age 55. Will you please describe the homes to me? The homes in Leisure Village are one story, California Ranch style homes. The homes were constructed as stand alone units, duplexes, triplexes, and four-plexes. On the units with a common wall, the individual walls have an airspace between each unit so you do not hear one another. Most of the homes have two bedrooms and one and three quarter baths. Some of the homes have a den and/or a formal dining room. The homes have mostly 1 car garages, but there are some 2 car garages, along with some carports. The homes were mostly built from 1977 to 1982. How much do the homes sell for in Leisure Village? Currently homes are selling from the 350's to the 700’s. Prices vary based on size, location, and condition. 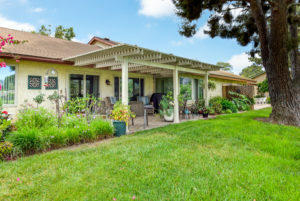 Call us at (805) 987-5755 or visit the featured homes on LeisureVillage.com to find out what homes are currently available and the current market value for these homes. May I have pets in Leisure Village? Yes, Leisure Village allows for two pets per household. When you take your pets outdoors, they must be on a leash and please remember you must pick up the droppings. Are all homes in Leisure Village owner occupied or are any homes for lease? Not all of the homes in Leisure Village are owner occupied. Currently about 10 to 15 percent of the residents in Leisure Village lease their homes. The association requires lease terms be for a minimum of one year and a maximum of two years. All other terms of the lease are negotiated between owner and tenant. 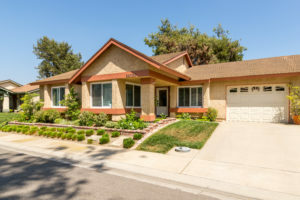 For information regarding available homes for lease please call us at (805) 987-5755 or BarlowPropertyManagement.com for currently available homes. May my children or a guest visit? Of course! Your guests are welcome to stay at your home three months cumulatively a year. Your guests are welcome to use most of he common area facilities of Leisure Village when they come to visit but they must be accompanied by a resident. What is the weather like in Camarillo? According to the Camarillo Chamber of Commerce, Camarillo has Mild Coastal Temperatures year round. The year round mean temperature is 73 degrees. The way many residents in Leisure Village describe it is just "a little peace of heaven on earth." Now that is nice weather and a great place to live, isn't it? What kind of activities and amenities are in Leisure Village? There are just too many to name them all so here are a few: 18 Hole par-three Golf Course, Tennis, Paddle Tennis (Pickleball), Olympic Size Swimming Poll (heated year round), Spa, Recreation Center with Billiard Room, Wood Shop, Ceramics, Lapidary, Art Painting, Choral, Dancing Groups, Theatre Performers, Music, Sewing Room, College Classes, Cards, Bingo, Photography, Chess, Scrabble, Book Reviews, Current Issues, Travel Committee and In House TV Channel. Don’t forget we have o ver 60 clubs so there is something for everyone here. This is one community where you are only bored if you have chosen to be. There is always something going on in the Village. Will you please tell me about the security at Leisure Village? The security at Leisure Village includes 24 hour guarded gates and patrol cars. All security personnel are trained in emergency First Aid. The patrol cars also use radar patrol to control speed. The speed limit is strictly enforced!! Where is the nearest grocery store, drug store, hospital, and airport? Are banks nearby? The closest store to Leisure Village is CVS Pharmacy located just outside the gates. 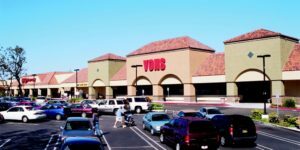 The closest grocery store is Vons which is in Mission Oaks Plaza about one mile from the Main Gate just up the hill on Woodcreek Dr. (Which is also where you find your favorite Real Estate Consultants - Barlow Realty) The closest hospital is St. Johns Pleasant Valley Hospital about four miles away. Also in the area are Los Robles Regional Medical Center in Thousand Oaks and St. Johns Regional Hospital in Oxnard. The closest commercial airport is in Oxnard about 20 miles away, but most residents use Burbank or Los Angeles International Airport which are about an hour away. As far as banks in the area you have Bank of America , Wells Fargo, and Chase Bank all within a mile. Does Leisure Village provide transportation in and around Leisure Village? Leisure Village is an active senior community and therefore does NOT provide transportation to its residents within the community. Residents either walk, bike, drive, (both fuel and electric vehicles) or some combination of each to get around in this active community. 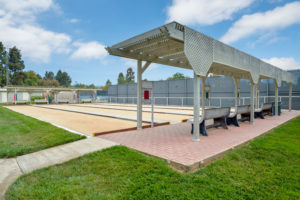 The city of Camarillo does provide free bus service for the fixed route service to Leisure Village residents and the bus passes through Leisure Village on the two main roads. The city also provides a Dial-A-Ride service at a discounted rate to seniors. How much is an average electric bill in this electric only community? I HAVE BEEN TOLD LEISURE VILLAGE HOMES HAVE NO GAS AND ARE THEREFORE POWERED ONLY ELECTRICALLY. SO HOW MUCH SHOULD I PLAN FOR AS AN ELECTRIC BILL? It is true that all the homes run off electric power. It is hard to put a number on your monthly bill because it will vary based on your usage, home size, and type/quality of appliances. Your best resource is to check with Southern California Edison Company at (800) 655-4555. If you call SCE and give them the address of the home you are interested in, they will give you an idea of the past average electric bills. You can also use www.sce.com. Am I Able To Transfer My Property Taxes? The State of California allows for seniors a one time property tax transfer but the Proposition is not honored in all Counties. HERE IS SOME INFORMATION FROM THE CA STATE BOARD OF EQUALIZATION'S WEBSITE. What are Propositions 60 and 90? Propositions 60 and 90 are constitutional amendments passed by California voters that provides property tax relief for persons aged 55 and over. Implemented by section 69.5 of the Revenue and Taxation Code*, it allows these persons, under certain conditions, to transfer a property's factored base year value from an existing residence to a replacement residence. Typically the property tax of a newly purchased or constructed residence is based on its current market value upon change of ownership. However, the provisions of Propositions 60 and 90 may result in substantial tax savings since it allows the adjusted base year value of the original (sold) property to be transferred to the newly purchased or constructed home if eligibility requirements are met. * Section 69.5 also sets forth the provisions of Proposition 110 which allows the transfer of a base year value for severely and permanently disabled persons. Except for the disability factor, the qualifications for Propositions 60/90 are same as Proposition 110.